Your balcony looks out onto a pier that seems to disappear into the endless Gulf. There's space for eight to watch a movie. The resort is made of three condo towers, each with their own pool and gym. Pool, Jacuzzi, beach, and ocean. The wide-open beach space gives you room to relax. Awarded a TripAdvisor Certificate of Excellence, Summerwind Resort by Wyndham Vacation Rentals is located directly on Pensacola Beach, near some of the best attractions in the area. Summerwind Resort is in the center of three condo towers, meaning you have access to triple the amenities. I hope you packed sunblock because you’re definitely going to use it. The resort has three gulf-front pools, pick one and jump on in, or try a different pool each day until you decide on your favorite. Relax with a soothing soak in one of the three hot tubs. When the kids get hungry, take advantage of the bbq grills for a family cookout. Now the only question is: burgers or hot dogs? The resort has three fitness centers, so there’s no excuse not to get in your daily workout. Air-conditioned, one- to three-bedroom condos sleep six to eight guests and are individually decorated. Full kitchens have everything you need to get in touch with your inner Julia Child. Tom Thumb grocery store is just a short walk from the resort. Bring the family along to make sure nothing important is forgotten. Back at the resort, assemble your world-famous lasagna and let the kids be in charge of the sauce spreading and cheese distribution. Don’t worry if things get messy, that’s what the in-suite washer/dryer is for. Enjoy a low-key night in thanks to the cable TV. Catch the latest episode of your favorite show or take advantage of the DVD player and have a family movie night with the kids. Summerwind Resort is just next door to Navarre Beach Fishing Pier. The pier is thirty-feet above the water and over fifteen-hundred-feet long. For your convenience, there is a privately-owned bait and tackle shop and a restaurant on-site. Take a family field trip to the Gulf Breeze Zoo. Experience a hands-on animal encounter or feed a giraffe. Little ones will love the farm where they can see goats, pigs, sheep, and llamas. Feed the birds in the Budgiery Adventure Aviary. The Safari Express Train Ride is a fifteen-minute narrated train ride where you will see deer, antelope, zebra, gorillas, hippos, and rhinoceros. Visit Santa Rosa Mall for a little retail therapy. Grab a coffee at Starbucks. Kids will love playing at Surge Trampoline Park, and tweens will love the accessories and jewelry available at Claire’s. Check out the apparel at Charlotte Russe, Old Navy, and the department stores Dillard’s and JCPenney. Catch a first-run movie at Regal Cinemas. 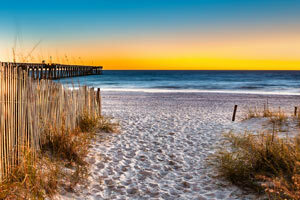 - Check-in for this property is based at the ResortQuest Navarre Beach Office, 8478 Gulf Blvd, Navarre Beach, FL, 32561. For more details, please contact the office using the information on the reservation confirmation received after booking.